“IF YOU DO one thing in Varanasi, visit the Monkey Temple.” The advice rings in my ears as the door of the train opens on to the loud, bright, smoky platform of Varanasi Junction. I join a trickle of foreign tourists heading for the exit, their dreadlocks and T-shirts an amusing counterpoint to the smart side-partings of the porters milling around them. Avoiding the touts offering me “the best room”, “the best meal”, “the best woman”, I hop into a rickshaw and we hightail it to the Old City. The approach to the ghats (ceremonial stairs) is a maze of alleys peopled as much by animals as humans. For every sadhu (holy man) in dusty make-up or monk in orange, there’s a giant cow blocking the way, or a sheep foraging some food or a goat asleep in a doorway. I’ve been to bigger Indian cities than Varanasi and none of them can boast this range of wildlife! I notice that the doors along the alleys are hung with baskets of offerings and pictures of Hindu deities. I guess these must be temples and shrines. I have no idea where I’m going. Somehow I end up on one of the ghats leading down to the argent waters of the Ganges. Long, eyelash-shaped rowing boats drift between devotees diving in, washing themselves and laughing like they’re having the time of their lives. I worry about them; I’ve read that it’s very polluted but they believe that bathing here will purify their souls. To my left is a huge fire tended by men wearing loincloths. I lift my camera but am politely told not to take a photo by a chai wallah (tea seller). He tells me that this is the Manikarnika Ghat (cremation ghat) and that this fire must never go out. He offers me a claypot of tea. Much as I love the milky, sweet, spicy brew, I politely decline. I buy a bottle of mango soda instead. 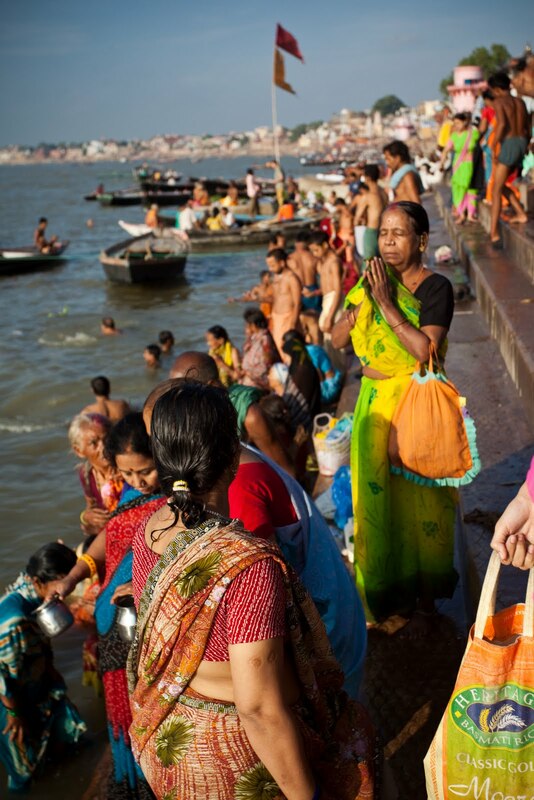 I make my way along the ghats, past the blazing parasols, the men in loincloths standing on one foot with their hands clasped together, the groups of washerwomen thrashing their clothes against the steps. Here, the soft morning sun rays dance across the waters, the temples and shrines hugging the shoreline are drenched in a golden hue and the air is filled with the delicate fragrance of incense along with the soft chants of soul-stirring hymns and age-old mantras. Behind me, the skyline is surrealistically varied: onion domes of mosques, the scarlet bell towers of modest Hindu temples, carved Jain pillars, Mughal turrets of faded khaki, gigantic statues of the Buddha. Three thousand years of architecture compacted together, overlapping even. I’ve been in Varanasi half an hour and already I understand its matchless appeal. A sect of young men all dressed in the same blue smocks with bricks on their heads stop in front of me. I am naturally suspicious. One of them asks me for alms. I hand over some rupees and ask for directions to the Monkey Temple. He tells me that I need to head back through the maze. I get hopelessly lost again. After asking for more directions, I find myself on a driveway swarming with monkeys which all, for some reason, have red rears. There are lots of monkeys here, so maybe I’m close to the Monkey Temple, I reasoned. A few minutes later, I am standing at a tall fence patrolled by dozens of grumpy-looking policemen with submachine guns. They are frisking visitors, confiscating their bags, cameras and mobile phones. As if that isn’t enough, there’s also a man-sized X-ray machine that all-comers must pass through. I can’t see anything of the temple itself over the fence, but there is the faint noise of singing. I can’t see the point of such zeal. Or perhaps this is a post-9/11 policy? After the ethereal pleasures of the ghats, I am put off by this distinctly un-spiritual spectacle. I turn round and head back up the driveway. I return to the ghats—eventually—and spend the rest of my day here, watching the sun go down and the worshippers singing and dancing and the beacons and fires come alive. DASASWAMEDH GHAT is one of the oldest and the main bathing ghat which attracts thousands of pilgrims, salvation seekers and tourists. MANIKARNIKA GHAT or “jewelled earring” is one of the oldest and perhaps the most sacred ghat. This is a cremation area where the mortal remains are “entrusted” to the flames, followed by prayers for the soul to rest in eternal peace. Hindus believe that anyone cremated here will attain moksha or salvation. ASSI GHAT is where pilgrims bathe before paying homage to Lord Shiva, who takes the form of a huge lingam situated under a peepal tree. TULSI GHAT is named in honour of Tulsi Das, a 16th-century poet who spent many years here composing the epic Ram Charit Manas. There is a temple on this ghat dedicated to Lord Rama. PANCH GANGA GHAT is believed to be the place where five rivers are said to meet. The Alamgir Mosque, built by Mogul ruler Aurangzeb, is located here. MAN MANDIR GHAT, built in the 18th century by the Maharajah of Jaipur, is noted for its splendid observatory which is outfitted with a number of elaborate window casings.